Last week’s other top-gaining TSX stocks were Mega Uranium, Avesoro Resources, Largo Resources and Corvus Gold. The S&P/TSX Composite Index (INDEXTSI:OSPTX) ended slightly lower last week, closing at 15,537.88 points, a modest loss of 0.28 percent. Reuters reported that on Friday (May 12) the index was pushed down when a slide in financial stocks offset gains in resource shares. Without further ado, here’s a look at the five top weekly TSX stocks and what moved their share prices. Mega Uranium is an exploration and development company focused on the acquisition and exploration of prospective uranium projects in Australia. The company currently operates the Ben Lomond, Georgetown and Kintyre properties in that country. 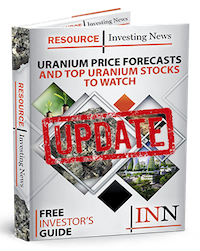 Last week, Mega Uranium saw a share price spike of 18.75 percent and closed at $0.19. It did not release any news that would explain that increase. Avesoro Resources is engaged in the exploration and development of gold deposits in Liberia and Cameroon. The company is currently focused on its New Liberty gold mine in Liberia, which is the country’s first and largest commercial gold mine. On May 11, the company reported revenues of $19.7 million from gold sales in the first quarter of 2017. On the back of the news its share price increased 14.29 percent to reach $0.04. Middle of the pack on last week’s five top weekly TSX stocks list is Largo Resources, whose share price saw an increase of 14 percent to close the five-day period at $0.57. Largo Resources is focused on the production of vanadium pentoxide at its Maracas Menchen mine in Brazil. The company also has a portfolio of other projects, including the Currais Novos tungsten tailings project, the Campo Alegre de Lourdes iron-vanadium project and the Northern Dancer tungsten-molybdenum property. The latest news from the company came on April 12, when it provided operational updates and announced a new term loan. Energy Fuels is a leading integrated US-based uranium miner that supplies U3O8 to major nuclear utilities. The company holds three of America’s key uranium production centers: the White Mesa mill in Utah, the Nichols Ranch processing facility in Wyoming and the Alta Mesa project in Texas. On May 11, the company announced the discovery of more high-grade uranium and copper mineralization at its Canyon mine. The news sent Energy Fuels’ share price up 9.22 percent to reach $2.37. Last but not least on the five top weekly TSX stocks list is Corvus Gold, whose share price saw an increase of 9.21 percent to end last week at $0.83. Corvus controls 100 percent of its North Bullfrog project in Southern Nevada. The project includes numerous prospective gold targets at various stages of exploration. The company’s most recent news came on April 27, when it announced sulfide gold recovery of 90 percent using the atmospheric alkaline oxidation method. Data for 5 Top Weekly TSX Stocks articles is retrieved each Friday after market close using The Globe and Mail’s market data filter. Only companies with a market capitalization greater than $50 million prior to the week’s gains are included. Companies within the mining and precious metals sectors are considered. The S&P/TSX Composite Index (INDEXTSI:OSPTX) remained almost neutral last week, closing at 15,582.04 points, down just 0.01 percent. That being said, Reuters notes that on Friday (May 5) the index saw its biggest gain in more than two months. The rise came as commodities prices rebounded from losses earlier in the week; oil prices in particular took off. Friday also brought the release of a US jobs report with better-than-expected data; however, according to experts it had little impact on the market. “There weren’t any major surprises in the jobs number that came in slightly better than expected. So all-in-all I believe the data was a non-event for the market,” said Andre Bakhos, managing director at Janlyn Capital. Without further ado, here’s a look at what moved the share prices of those companies. Wellgreen Platinum is an exploration and development company focused on advancing its Wellgreen platinum-group metals and nickel project. On May 1, CEO Diane Garret sent a message to shareholders regarding the company’s declining share price, and clarified the strategy that it will use to develop Wellgreen. The news sent the company’s share price up 15.56 percent to close the five-day period at $0.26. Orocobre has a portfolio of lithium, potash and boron projects and facilities in the Puna region of Argentina. Its most recent news came on April 27, when it announced that Phase 1 drilling will soon start at its flagship lithium property in the Cauchari Salar. Advantage Lithium (TSXV:AAL) is partnered with Orocobre on the project. Last week Orocobre’s share price saw an increase of 8.39 percent to reach $3.36. Middle of the pack last week was Scandium International Mining, whose share price saw an increase of 7.69 percent to close the period at $0.42. The company holds an 80-percent interest in the Nyngan scandium project, located in Australia. On May 5, the company received a mining lease grant for the project. Arizona Mining is an exploration and development company focused on its Hermosa project in Arizona. On May 1, the company signed a $110.3-million binding private placement with South32 (ASX:S32). The news sent Arizona Mining’s share price up 6.88 percent to reach $2.02. Last but not least is Tahoe Resources, whose share price increased 6.24 percent to close last week at $11.75. Tahoe is focused on the exploration, development, operation and acquisition of precious metals properties in the Americas, and its principal asset is the Guatemala-based Escobal silver mine. On May 1, the company announced record results for the first quarter of 2017. Editorial Disclosure: Arizona Mining and Advantage Lithium are clients of the Investing News Network. This article is not paid-for content. The S&P/TSX Composite Index (INDEXTSI:OSPTX) ended last week slightly down, closing at 15,586.13 points, a loss of 0.15 percent. According to Reuters, stocks edged lower on Wall Street on Friday (April 28) after traders cashed in on recent gains. They did so on the back of data showing that the US economy grew at its weakest pace in three years. “The GDP numbers today are questioning the robustness of the economy and throughout the week we’ve seen the impact of doubts whether the Trump administration can implement its fiscal policies,” said Mohannad Aama, managing director of Beam Capital Management in New York. Without further ado, here’s a look a look at what moved the share prices of those companies last week. Nevada Copper is currently working to bring its Nevada-based Pumpkin Hollow copper project into production. The most recent news from the company came on April 28, when it announced the results of its annual meeting. Last week, Nevada Copper’s share price spiked 17.86 percent to close at $0.66. Largo Resources is focused on the production of vanadium pentoxide at its Maracas Menchen mine in Brazil. The company also has a portfolio of other projects, including the Currais Novos tungsten tailings project, the Campo Alegre de Lourdes iron-vanadium project and the Northern Dancer tungsten-molybdenum property. On April 12, the company provided an operational update for Maracas Menchen and said that it has entered into a term loan agreement. Largo has not released any news since then, but last week its share price increased 13.46 percent to reach $0.59. Middle of the pack last week was Orocobre, whose share price saw an increase of 8.77 percent to close the five-day period at $3.10. Orocobre has a portfolio of lithium, potash and boron projects and facilities in the Puna region of Argentina. On April 27, the company announced that Phase 1 drilling will soon start at its flagship lithium property in the Cauchari Salar. Advantage Lithium (TSXV:AAL) is partnered with Orocobre on the project. Hudbay Minerals is an integrated mining company that produces copper concentrate and zinc metal at operations across the Americas. The most recent news from the company came on March 30, when it provided an update on its operations and growth projects. Last week, Hudbay’s share price rose 2.9 percent to reach $8.15. Last but not least is Western Resources, whose share price increased by 6.78 percent last week to close at $0.63. The company was recently established to focus on the Milestone potash project in Saskatchewan, and it started trading on the TSX on April 5. Editorial Disclosure: Advantage Lithium is a client of the Investing News Network. This article is not paid-for content.